In the past few weeks I’ve spent countless hours scouring recipe books, looking online and attempting to find the perfect menu for our Thanksgiving dinner. I am hosting and as it isn’t a tradition I grew up with I don’t want to mess it up and want the dinner to meet the expectations of the family and friends that are invited. I’ve read articles, looked on Pinterest and jotted down copious amounts of ideas and still haven’t been able to perfect the menu. I finally asked those attending what they wanted on the table and was somewhat surprised by the simplicity of the answers. 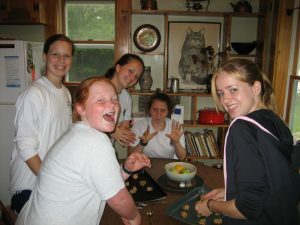 Cooking with friends at Camp Runoia. ‘I just love mixing cranberry sauce with the regular mash potato,’ ‘oh nothing fancy just the ordinary dishes will be perfect,’ there was even a request for ‘green bean casserole’ as it is a fond reminder of growing up in the 1960’s! Some asked if it was OK if they brought a favorite dish that they enjoy making or offered to share the bounty of their harvested vegetable gardens. Others have no preferences and are just looking forward to getting together and enjoying the company. All people really expect is a table to sit around (I’d better make sure we have enough chairs!) and the time to share a meal together. 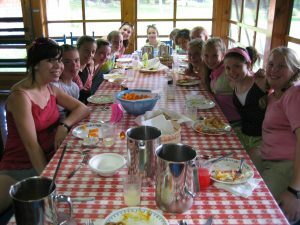 The simplicity of the expectations, the reverence of the tradition and familiarity of having the old favorites remind me so much of summer at Camp Runoia. While there are changes with the times (yes I will have gluten free and vegetarian options for Thanksgiving!) so many things remain the same. No matter how long you have been away or even if you are arriving for the first time the feeling of coming home to a comfortable and welcoming community is all that really matters. It is often the simple, traditional things that have the most importance and that create the lasting memories. Here’s to not over doing it and just sharing food with family and friends in whatever way feels right and makes people happy. Ready Set Go – All Runoia All Summer!